The Federal Cabinet secretary K. M . Chandrashekar in his letter to the ministers directed against being part of the function organized by the Gandhi Peace Foundation and the All India Parliamentary Forum for Tibet to honour the Tibetan spiritual leader, Dalai Lama. The reason being that it is not in conformity to the government's foreign policy. One of the prime reasons the Left parties are opposing the Indo-US nuclear deal is to ensure that another nation (US) does not have influence on India's foreign policy. 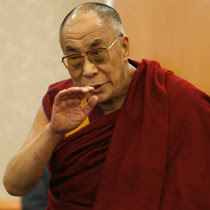 However, the decision to ensure that ministers of Indian Government are not part of a function to honour Dalai Lama, the goverment was trying to please China. Is this not allowing a foreign nation to have influence on our foreign policy? Is this what the left parties mean by independent foreign policy? The Left parties are all for pro China government policies just because of the fact that a communist government is ruling there. I have nothing against China. I feel that India should not become a tail wagging pet. Neither for the US nor for China. The government of India has again succumbed to the blackmailing tactics of the Left parties. This was what I feared would happen. I would like to see a powerful India which demands what it rightly needs for development. Hence, if the Indo-US nuclear deal would help us develop we should go for it, unlike the Left parties who have a narrow minded approach towards the deal. Similarly, why should India say or do things to please any country. Why should it fear China? We are not hostile towards China. We should continue developing good trade relations with China without compromising on India's right to take it's own decisions. India beats Pakistan to claim the first ever 20-20 World Cup Title. The Final match was a roller-coaster ride. Pakistan looked in control after it restricted India to a total of 157 in 20 overs. It also looked in control when Imran Nazir was hitting the Indian bowlers to all parts of the ground. However, after his exit India was back in the game and seemed to be cruising along to victory. But then Misbah-ul-haq was standing tall and he almost swung the pendulum in Pakistan's favour. Just when Indian fans were thinking that the match is lost, Misbah-ul-haq's wicket falls and India wins. India won the toss and elected to bat first. It is always crucial to win the toss and elect to bat in an important match. Chasing in a world cup final is not easy at all. Mahendra Singh Dhoni once again took the wise decision of batting first. However, the Pakistan bowlers bowled a tight line and length and never let India to take charge. Yusuf Pathan came in as a replacement to the injured Sehwag. Yusuf Pathan is Irfan Pathan's elder brother. He is a good hitter of the ball and bowls off-spin too. He hit some good shots but lost his wicket early. Gautam Gambir continued to be solid. Robin Uthappa gave away his wicket early. Yuvraj Singh or should I say the six hitting machine also could not continue his good work. Umar Gul took his wicket. Umar Gul was the pick of the bowler for Pakistan. All Pakistani bowlers bowled nicely. They kept the Indian Tigers from cutting loose. It was Gautam Gamhir's 75 and Rohit Sharma's 30 that brought India to a respectable total of 157 for the loss of 5 wickets. Pakistan did a great job of restricting India. As always chasing in a final of a world cup match is not easy at all. But then the Pakistani's started off well. Though Mohammad Hafeez lost his wicket early, Imran Nazir was hitting sixes and fours and laying the foundation for a Pakistani victory. The hearts of Indian fans was sinking like the Titanic. Kamran Akmal was clean bowled by Rudra Pratap Singh. Imran Nazir was run out by an accurate and direct throw at the stumps by Robin Uthappa. Younis Khan too literally threw away his wicket when he should have played sensible cricket. Shahid Afridi was out for a duck, caught by Sreesanth of the bowling of Irfan Pathan. But Misbah-ul-haq was still there. He is a dangerous customer. He started hitting sixes and Sohail Tanvir gave him good support. Harbhajan and Sreesanth were targeted in particular. Sohail too hit few sixes before getting bowled by Sreesanth. Umar Gul lost his wicket trying to hit R P Singh. Wickets kept falling at the other end but Misbah-ul-haq seemed still in control. The match went into the last over of the match. Joginder Sharma was given the ball. He initially bowled a wide bowl. The next ball was hit for a six. But the next ball he bowled was the one that helped India defeat Pakistan. 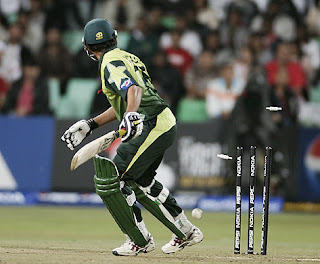 The improvisation made by Misbah-ul-haq to hit the ball over fine leg got the better off him. He was caught by Sreesanth and Misbah was disappointed to have thrown away the match from a winning position. He just needed 6 from 4 balls but could not keep his patience. The catch taken by Sreesanth decided the World Cup champion. Misbah-ul-haq is devasted after losing his wicket. He could have easily won it for Pakistan. The whole Pakistani Team could not believe it that they lost the match as they were so close to winning it. Indian team marshalled by Mahendra Singh Dhoni has transformed itself into world beaters. 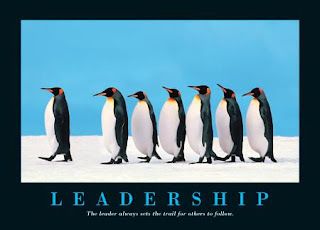 Dhoni has emerged as a great leader. Young players like Robin Uthappa, Rohit Sharma blossomed under Dhoni's captaincy. The cool headed nature of Dhoni seems to have rubbed over to it's team members. Everyone chipped in one way or the other in every match played. 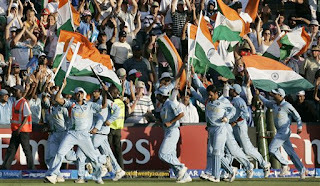 First time India was not depending on the stars to win the match for us. All 11 players contributed throughout the series. It was a team effort in real sense. Irfan Pathan along with his brother Yusuf Pathan. Irfan Pathan was awarded the Man of the match for taking 3 crucial Pakistani wickets. Irfan Pathan has come back well after being dropped from the ODI team. Yusuf Pathan and other team members celebrating the win. Indian team members were very excited after this victory and rightly so. 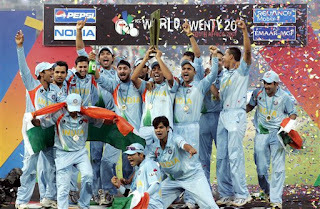 After 1983, it is for the first time that the Indian team is holding the world cup in their hands. It was a long wait after coming close under Ganguly's leadership. The victory run by the Champions. It was a great sight to see the Indian tri-colour flying high. Champagne being uncorked. Every Indian Team member is soaked in Champagne. After all it is time to celebrate this great victory. Let the world take notice of the new world champions. 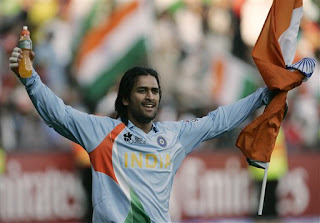 I am sure the Indian team will continue the winning streak under Dhoni's leadership. There are many positives to take from this 20-20 World cup. Young players who stood strong in difficult siutations. Rohit Sharma is one of the best finds for India. He is just 20 yet he played such a mature innings. He scored quickly and yet was always in control of the situation. This is how champions play. No matter what the situation,they play without fear. I am sure the Indian Team will continue to play fearless cricket in the coming days. Unlike the first semifinal of the first ever 20-20 World Cup played between Pakistan and Newzealand, the second semi final played between India and Australia was a thriller. It was the clash of the titans. Indian captain Mahendra Singh Dhoni won the toss and decided to bat first. It was a wise decision to take because chasing in big matches is not easy at all. Virender Sehwag and Gautam Gambhir started off slowly but steadily. They didn't add runs quickly but they ensured that wickets were intact. After the exit of the openers the six hitter Yuvraj Singh and Robin Uthappa took charge of the situation. Yuvraj started off from where he left in the match against England. He had hit the fastest fifty ever in any form of the game against England. Six sixes were hit by him in one over of Stuart Broad. In the match against Australia too he started hitting sixes at ease and one of the sixes he hit was the longest by any batsman. The ball travelled 116 metres. Yuvraj scored 70 of just 30 balls. Robin Uthappa gave him good company before getting run out by an accurate throw at the stumps by Andrew Symonds. Dhoni and Rohit Sharma continued the good work and helped India reach a total of 188 runs in 20 overs. Rohit is the youngest player in the Indian team but shows good composure in pressure situations. The total seemed good enough but when you are facing the mighty Australians you cannot sit back and relax thinking that they won't be able to make it especially when they have Adam Gilchrist and Mathew Hayden as openers. Indians didn't give away too many runs initially. However, the Australians didn't lose any early wickets either. Moreover, both their explosive openers were still at the crease. Adam Gilchrist and Hayden started hitting balls to the boundary and over it. 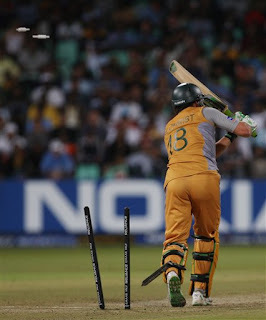 Sreesanth took the wicket of Gilchrist when he was starting to get dangerous. Mathew Hayden and Brad Hodge then scored briskly but he was caught off the bowling of Irfan Pathan. Andrew Symonds joined Mathew Hayden and they both hit sixes and fours. Again it was the turn of Sreesanth to give the break through. He clean bowled Hayden and set the stage for an Indian victory. Mike Hussey joined Symonds and they were inching towards victory. But Irfan Pathan took the wicket of Symonds to slow down things. Rudra Pratap Singh bowled a nice line too and didn't allow the Aussies to score. Harbhajan took the wicket of Stuart Clarke. Clarke is a dangerous customer too. He can win a match for Australia from any difficult situation. His early exit ensured that Australia didn't get another chance to go for a win. Joginder Singh too bowled nicely. Joginder was bowling yorkers and low full tosses and didn't give too many runs. 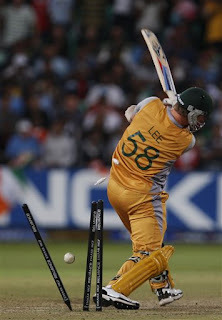 He clean bowled Brett Lee but India already had the match in it's kitty by then. Harbhajan Singh with the stump in his hand after India made it to the Finals of the 20-20 World cup. Yuvraj Singh and Dhoni hugging each other after the victory. Yuvraj was awarded the man of the match award for scoring 70 runs of just 30 bowls. The Indian Team in a huddle celebrating after defeating the 3 time ODI World Cup Champions in the semi-finals of the 20-20 World Cup. They are now looking forward to the Finals against Pakistan and start of as favorites to win the Final after the solid performance against Australia. India beat Pakistan to win the first encounter between the two in the 20-20 World Cup. India Pakistan encounters have always been closely fought and it just cannot get better than this. The match was a tie but unlike in other forms of cricket, 20-20 matches now have a way to decide the winner by bowl-out similar to penalty shoot outs in football. India was put into bat by Shoaib Malik, the captain of Pakistan after winning the toss. India lost four wickets in quick succession. But Robin Uthappa or should I say Robinhood hit few sixes to bring India back into the match. Mahendra Singh Dhoni, the Indian captain for the shorter version of the game too played a solid innings. In the end Irfan Pathan hit few sixes and Ajit Agarkar hit some boundaries and brought India to a respectable total of 141 runs. Mohammad Asif was the pick of the bowler with 4 wickets for just 18 runs. He was awarded the Man of the match though his efforts were in vain since Pakistan lost the match. India bowled and fielded well but Pakistan came close to victory. In the last 2 balls, Pakistan needed just 1 run to win. Sreesanth bowled nicely. The first of the last 2 balls was a dot ball. The second ball the batsman ran but was run out and the match was at a tie with both teams on identical scores. However, a bowl-out was going to decide the outcome of the match. It is similar to penalty shoot out in football. Here 5 bowlers from each team bowls at unguarded stumps and try to hit it. The team with the maximum number of hits out of 5 chances each that they get, wins the match. From India, Virender Sehwag, Harbhajan Singh and Robin Uthappa all were successful in their attempts to hit the stumps. But from Pakistan, Umar Gul, Yasir Arafat and Shahid Afridi all three missed the stumps and thus Pakistan lost the match. 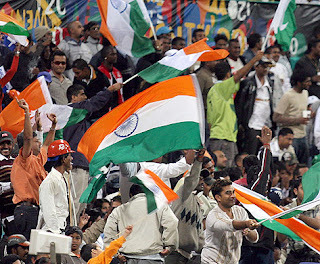 India continues to have an unbeaten record against Pakistan in World Cup matches. In the information world of today, the media plays a big role in influencing the society. Indian government is very much liberal when it comes to the media. However, today the media especially the news channels are stooping too low to increase their TRP ratings. At times I fail to realize that I am watching a news channel and not an entertainment channel. I understand that there is nothing wrong in reporting of popular reality shows on news channels. However, today these news channels end up devoting more than an hour on telecasting video shoots of reality shows. Is this what news channels are supposed to do? A very recent incident of how 16 year old Adnan's Patrawala's killing was somehow influenced by the role played by news channels is the best example of how things could go wrong if the media does not behave in a responsible manner. Adnan met 3 guys in some Pool club 6 months ago. By these regular meet they came to know all about Adnan & they planned to trap him. They created fake id of “Angel”(girl) & posed to Adnan in Orkut community & lured him. They arranged all things & told Adnan via “Angel” that come near some mall if you want to meet me in person . Adnan went & they abducted him . They rang up his parents & demanded ransom.The 1st call was considered by parents as a prank , but after 2nd call they realise what the situation is. Parents registered complain in Oshiwara police station , police got into action but news got leaked to news channels & all National news telecasted the story of kidnapping. The kidnappers panicked & killed Adnan. Though police manged to catch all 3 , an innocent boy lost his life in the bargain. I heard one news channel blaming Orkut for the murder. A knife is used in the kitchen to cut vegetables and the same knife can be used to kill a human being. Will you ban the knife from use in kitchen because it was or can be used to kill someone? The media could have come up with ways to educate people on safety measures to be taken while using social networking sites like Orkut instead of putting the blame on orkut. This way they could have portrayed themselves in good light. The media is quick to pounce on governments, police officers, government run organizations for not behaving in a responsible manner. Then what about the media. Are they not supposed to behave in a responsible manner? The media has played many positive roles too. Highlighting the issues of corruption, illegal activities, drug abuse and many more. I hope they stick to that role and not be a cause for panic and chaos in the society. Adulterated food and the magnitude and scope of adulteration is a big cause of concern. Adulteration of milk and milk products, synthetic milk and milk products being sold, dead chicken from farms making their way to the kitchens of restaurants are a big threat to the health and well-being of society. Just for the sake of making quick money people are risking the lifes of so many. They do not realize that the same adulterated food made by them could end up in their food chain by some way or the other. And the money earned by them making and selling adulterated food might not save them from the consequences caused due to consumption of such food. I hope the administration takes note of this and takes steps to ensure that quality of food products are not compromised with. Indo-US Nuclear deal - Is the Left right? I do not understand the Left parties. I never did and I have stopped trying to. 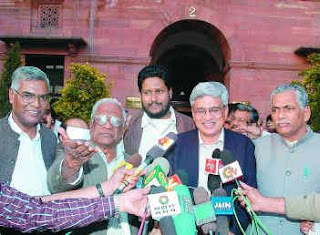 What were the left parties doing when the Indian government started negotiations with the US government on the Indo-US nuclear deal? Were they sleeping? When the deal is in the final stage they wake up from their slumber and are opposing the deal. care of. If the nuclear deal takes care of this then we need to go ahead and finalize the deal. 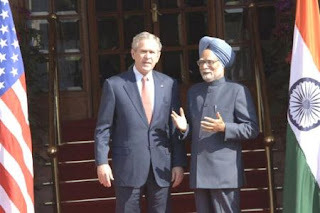 With friends like these (Left parties), the UPA (United Progressive Alliance) does not need enemies. I consider the Left parties stand on the nuclear deal as anti-national.